Curtain made out of slides – ¿¡ tjongolongo ?! 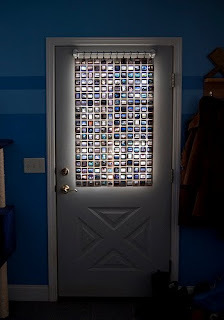 I came across this cool looking curtain put together by loads of Kodachrome slides. The curtain really made me go Tjongolongo! I think this is a very cool and creative way of using up old slides like this. If you own a photo shop it would make for a nice window display as well. A nice bit of marketing. The slides date from the 50s and early 60s. In each slide 8 holes were drilled and the slides were than connected together using aluminum chainmail rings. Tjongolongo, I really love these Kodachrome curtains, I might try something out like that myself one time! Would you like to have a curtain like that in your home?